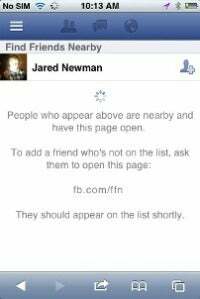 If you're having trouble looking up new acquaintances on Facebook, a new feature called "Find Friends Nearby" can help. 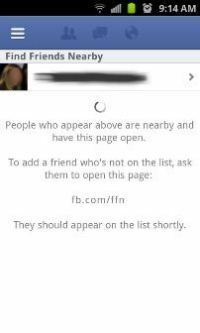 When multiple people launch this feature in close proximity, they'll see each other's names in a list, even if they're not friends on Facebook. For each list entry, there's a button to quickly add that person as a friend. To be clear, the feature only works when both parties have the Friends Near Me page open at the same time. In that sense, it's a lot different from the infamous "Girls Around Me" app, because it doesn't draw on public data, and only locates people who are actively looking for other Facebook users. Over at TechCrunch, Facebook engineer Ryan Patterson explains that Find Friends Nearby is best used as a way to share contact information with someone you've just met without exchanging business cards. Still, the fact that anyone can show up on the list -- even complete strangers -- could make for creepy encounters. That may explain why Facebook isn't giving this new feature a lot of promotion yet. There's been no official announcement about it, it's buried pretty deeply within Facebook's mobile apps. Find Friends Nearby needs more prominent billing to be useful, but putting this feature front and center might scare people away if they'd be visible to strangers. Facebook must tread carefully with this feature, and find a way to execute Patternson's idea -- that is, replace the business card with a Facebook exchange -- without causing privacy concerns. For now, the company has done the right thing (surprise, surprise) by keeping a low profile for Find Friends Nearby.